What is a SSA 561 U2 Form? A SSA 561 U2 form is used by the Social Security Administration. SSA 561 U2 Form: What Is It? 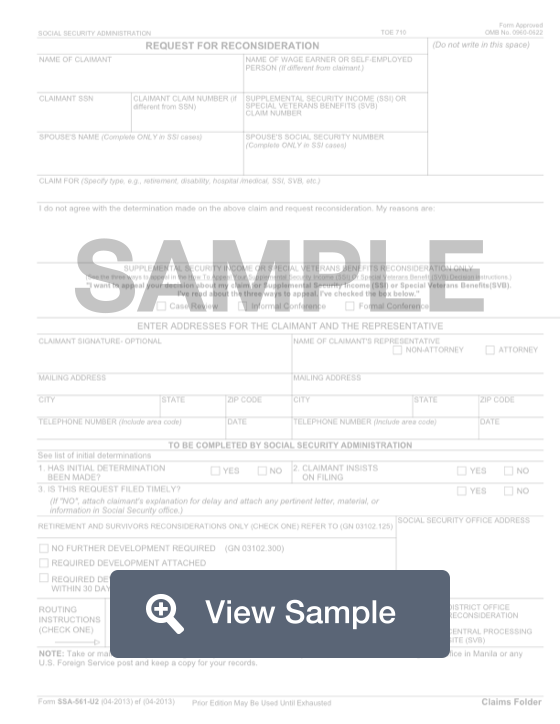 A SSA 561 U2 form is used by the Social Security Administration. The form is used as a Request for Reconsideration. This can be used if someone was denied Social Security benefits like disability or supplemental security income due to a medical reason. People can also people the Social Security Administration's decision based on non-medical reasons, such as the amount of time worked or an overpayment. This form is used if someone does not wish to file their appeal online. It should include the person's social security number as well as their claim number. When sending in this form, you will also need to include a copy of the disability report as well as an authorization to disclose information to the Social Security Administration. Create a free SSA 561 U2 Form in minutes with our professional document builder.